"Beautiful Festival of the Valley"
One of the many questions people have about the pyramids of Egypt is why they were built. The Egyptians built these pyramids for numerous amounts of reasons, which mainly included making their king happy. The pyramids symbolised the very first rising up of the Earth from its chaotic regions (see "Egyptians' Theory of the Creation of the Earth"). The pyramids were linked with the skies, as well as the depths and ancient waters. Egyptians believed their pharaohs were gods or sons of gods, and that after death they rose up to the stars. The pyramids resembled ramps which helped the pharaohs climb up into heaven. Pyramids were also meant to protect the embalmed body of the pharaoh and the precious objects placed in the tomb against robbers. The Egyptians believed that the dead person lived after their death in the underworld. In ancient Egyptian times, stoneworkers had few tools available to cut solid rock. The tools that they did have were chisels, saws, mallets, hammers and wedges. The chisels and saws were made of metal, the mallets and wedges were made of wood and the hammers were made from rock that was tied onto a wooden handle. Before the cutting process began, marks were drawn on the rock to outline the shape of the block. Then, small cracks were made on the stone using chisels and mallets. Workers hammered wedges into the cracks and soaked the area with water. This resulted in the wedge swelling and finally splitting the rock. Some people say the Egyptians also headed the cracks and cooled them in water. No one knows exactly how the Egyptians carried the heavy blocks to the very top of the pyramids. Egyptologists have two theaores. One theory is that Egyptian workers tied ropes of palm fiber to a block and tilted one side with a lever. Another theory is that workers might have used a weight arm to lift each block. One thing for sure is that Egyptians lifted a block, then slipped a wooden sled underneath it. Men pulled the sled, following a path of logs that were laid and stopped the sled from sinking in the sand. The blocks were brought to the Nile and loaded on barges. Then they were smoothed and cut to the exact size as the other blocks. Before a pyramid was built, its structure had to be carefully planned out so that it could be built on a solid base and not fall down. First, the area of sand and gravel was cleared until the rock floor of the desert was visible. For the site to be made perfectly level, Egyptians used water to form a straight and level surface. A network of trenches was dug, then the water line was marked on the sides. The trenches were then drained and the ground's surface was cut down to watermarks. Finally they filled the trenches with rubble. Architects meanwhile draw the building plan on clay tablets. The pyramids that the architects planned out contained many rooms and tunnels. There was a chamber that included the pharaoh's sarcophagus. Another chamber included the pharaoh's treasures which he would need for the afterlife. There was a passage built from outside so that the pharaoh could be carried to his reasting place. Chambers for the pharaoh's wife was found in some pyramids. There were two layers to a pyramid which were the interior chambers (made of granite) and the outer surfaces (covered with white limestone). 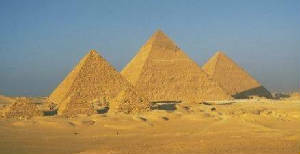 Pharaohs gave the idea to build pyramids. People who built the pyramids were not slaves! They were farmers, sculptors, architects and masons. Only six machines existed at the time of ancient Egypt. There was the lever, the wheel, the wedge, the inclined plane, the pulley and the screw. About 4000 people worked all year to build the pyramids. The pyramid blocks were cut from limestone using stone and copper tools. 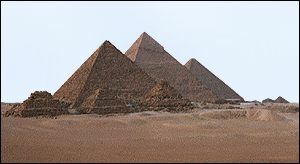 Pyramids took 20 years at the most to build. Many workers died while building them. 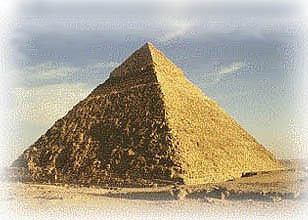 The first pyramid was built in 2680 B.C. and the Great Pyramid was built in 2550 B.C. The bricks that were layered on the outside of the Great Pyramid were made of white limestone. It was built with 2,300,000 blocks which in total weighed 5,750,000 tons (each block weighed 2.5 tons). Each side of the pyramid was 775 feet (230 metres) tall.